I wished for a good movie adaptation of Into the Woods and I got just what I wished for. The translation from stage to screen of one of my very favorite musicals came off excellently. The story, which takes a few traditional fairy tales and mashes them all together to get everyone to the happily ever after in the first half of the film, only to go quite dark for the second half, was directed wonderfully by Rob Marshall. Despite great trailers, I was skittish of how Marshall would adapt the material to the screen since he’d done a wonderful job with Chicago but destroyed Nine. Yes, some things were trimmed out to make this more cinematic. The end of Act I, “Ever After” is present only in the score as James Corden narrates how everyone got their wishes. Subsequently, the Act II intro “So Happy” is also gone. This makes sense for the movie since there’s no intermission or need to reintroduce the action. How the movie connected the acts was rather brilliant so that there was no break in the pacing or a time jump. Rapunzel’s story got a second act re-write for the film, which I’m assuming was also for pacing since there are many threads running through the plot. The most disappointing cut was the removal of the touching “No More” between the baker and his father. Marshall nailed the casting. 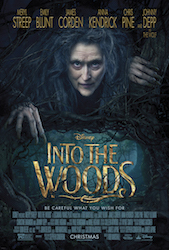 Meryl Streep is a delight as the witch, giving us wonderfully different vocals as she transitioned form hag to beauty. James Corden and Emily Blunt were awesome as the Baker and Baker’s Wife. Their chemistry was spot on, and Blunt was particularly excellent in the second act. 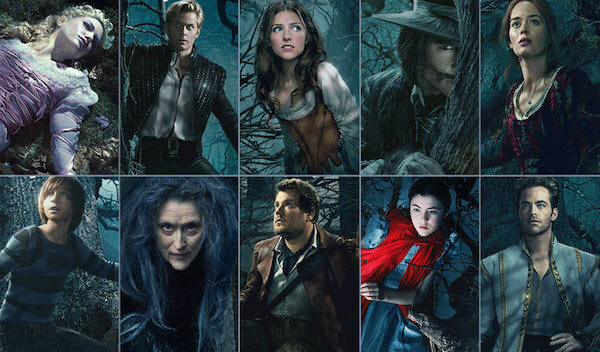 I loved the play between Lilla Crawford as Little Red Riding Hood and Johnny Depp as The Wolf. Depp took a five minute cameo and made it memorable. Chris Pine nearly stole the movie for me. His Prince Charming was a hoot and the duet with Rapunzel’s Prince, played by Billy Magnussen, for “Agony” was off-the-charts funny. Daniel Huttlestone as Jack was great, and he also provided a good foil for Little Red in act two. Tracey Ullman, too, was funny and feisty as Jack’s mother. The woods were brought to life perfectly for the film. Everything was lush and beautiful in one moment, only to be dangerous and foreboding in the next. Being able to see the beanstalks grow, and the giants give chase was thrilling. The quiet moments, however, were my favorites. “No One Is Alone,” “Stay with Me,” “It Takes Two” and “Moments in the Wood” were exquisite. For me, this sits alongside the excellent filmed production from the Into the Woods original cast as a definitive version of this musical. It’s leaps and bounds better than the 2002 Broadway revival. I’ve heard the production happening in off-Broadway from the Roundabout Theatre Company (a limited engagement scheduled to run through March 22) is incredible, but unless it extends by a month I won’t get to see that to make a comparison.